The descriptions include each horse’s last start (with a YouTube link if available) and possible next start for each horse and a career summary of starts with results, total earnings and graded stake earnings with the rank amongst Derby contenders. You will also find the closing odds from all three of the Kentucky Derby Future pools. According to www.HorseRacingNation.com $300,000 is currently required to make the top 20 of graded earnings. 1) Hansen – Last week ranked 1. Career – 5: 4-1-0 $1,473,305 (1st $1,400,000). Blue Grass (G1) – April 14. 2) I’ll Have Another – Last week ranked 3. 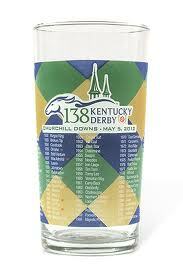 Kentucky Derby (G1) – May 5. 3) Creative Cause – Last week ranked 2. Career – 6: 3-2-1 $851,000 (4th $836,000). 4) Gemologist – Last week ranked 4. 5) Daddy Long Legs – Last week ranked 5. Career – 5: 3-0-0 $1,308,909 (2nd $1,294,030). 6) Union Rags – Last week ranked 6. 7) Alpha – Last week ranked 9. Career – 6: 3-2-0 $500,000 (14th $380,000). 8) Bodemeister – Last week ranked 7. Arkansas Derby (G1) – April 14. 9) Optimizer – Last week ranked 8. 10) Take Charge Indy– Last week ranked 10. Career – 6: 2-2-0 $721,000 (7th $698,400). This entry was posted in Derby Top 10, Horse Racing Nation, Kentucky Derby and tagged Derby Top 10, Horse Racing Nation, Kentucky Derby. Bookmark the permalink.